Tropical breezes, the sound of the surf, and spectacular sunsets from the balcony of this beautiful luxury condominium, where living area and master bedroom overlook sugar white sandy beaches and the emerald green waters of the Gulf of Mexico. Our beautiful Long Beach Resort condominium features exceptional quality in upscale luxury living, with oceanfront views from floor-to-ceiling windows, beautiful Florida decor, and a spacious private balcony that can be accessed through the living area or master bedroom. • For guests who bring their laptops, WiFi Internet connection is available. • Take a Front Beach Rd Trolley or stroll along the beach picking up shells! • BRAND NEW: DAVE AND BUSTERS!! • The Grand with 16 Movie Theaters! & IMAX!! Just a few of Pier Park attractions! • The Historical Miracle Strip Amusement Park is also located In Pier Park. St. Andrews State Park is popular location for swimming, boating, camping, hiking, and fishing. There is also Zoo World, Shipwreck Island Water Park that the kids will love, or beach clubs offering day and night entertainment. Panama City Beach is known as 'the Seafood Capital of the World' and is host to an array of colorful dining establishments. There are many casual eateries as well as award wining restaurants. We have it all. There is definitely something for every age and taste in Panama City Beach. Enjoy!! Long Beach Resort features 1300 feet of magnificent sandy white beaches and beautifully landscaped tropical grounds. Enjoy the 6800 square foot lagoon pool with waterfalls and palm tree islands, an expansive sundeck, two heated Polynesian pools, and three whirlpool spas. Relax with your favorite beverage and snack at 'The Hang Out' poolside bar and grill. * Must be 18 or older to rent. No smoking. No pets. * $300 reservation & security deposit required. * Call or email for monthly rates. PERFECT! This was a fantastic condo &#x2014;perfect location perfect service! Great deal and hope to stay here many more times! The view and balcony were awesome! Comfortable bed! Huge tub! Everything you need to cook! Just awesome!!! The property manager was very unhelpful. The vacation rental was somewhat dirty. I was very dissatisfied with the condition of the vacation rental. 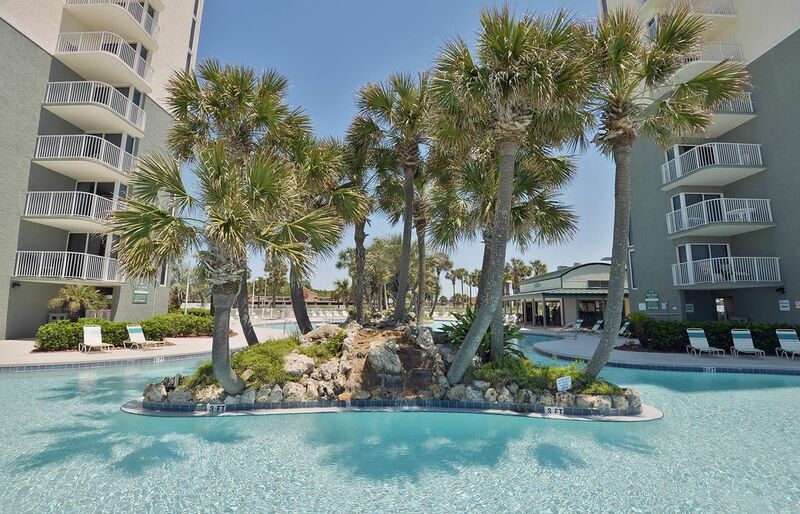 For our third stay at PCB in february 2019, this one was the most disappointing. The Long Beach Resort had no swimming pool available during our stay. There is no gym in the complex. The apartment is not as beautiful as in the photos, it is old and decrepit. The heating and cooling system was broken during our stay. We were disappointed with the rental company, FOUR STAR CONDO SERVICES, when we arrived, there was no parking permit in the unit, as expected. We contacted Four star condo service who told us that it was impossible, that the permit was indeed in the apartment (photo to support it) and that we had to pay for a new permit. We mentioned that we also took a picture that shows that the permit is not there. Four star condo service told us again that it was impossible, so the customer here is always wrong. We are being led to believe that we are playing games to get a second permit without paying! We went to the Four Star Condo service office the next day to clarify the situation, and then, surprise, they retrieved the permit. they told us that the housekeeper had taken the permit. they given to us the permit without any excuse. We believe that we will no longer do business with Four Star Condo service. For the rest, Panama City Beach is magnificent despite the drama that shaken it in December 2018. I was somewhat dissatisfied with the condition of the vacation rental. The resort was very peaceful. Great beach access. The room however was a different story. It was very stuffy and humid. Half of the lights didn't work and it was very dark. The A/C did not get below 72 and it was extremely humid in the condo, turning on the fan wasn't an option because of the constant rattling of something loose in the fan. The shower only stayed warm (not hot) for about 10 minutes. There was no light outside on the balcony, or a ceiling fan light in any of the rooms. Half of the lights in the bathroom didn't work so it was extremely dark in there. Overall, the stay wasn't terrible, but I would not go back. I would find a different unit. The staff went the extra distance to make sure we had a great place to stay when our other accommodations fell through. Much appreciated. Worst experience I have ever had renting a condo. Air conditioner didn't work, toilet kept running, bathroom sinks were slow draining, washer smelled like a sewer when turned on, kitchen sink leaked around the faucet, garage disposal would not work and backed up in the sink when the dishwasher was running with a horrible smell. Yes maintenance was busy getting things in place due to the hurricane coming, but I called right after check in (paid extra to check in early @ 1:00pm) and it took until the next day at 4:00pm before maintenance came. We did have to evacuate for the hurricane so we did not get to stay the full 6 days. We could not enjoy what time we had due to all the issues, mainly no air in the condo. Very unhappy and disappointed to pay that much money and the condo to be in such poor condition. Currently waiting for a refund for our last 4 days since it was a mandatory evacuation! Rates exclude tax and cleaning fees.